Tremor is an involuntary, rhythmic contraction and relaxation of two opposing muscle groups producing oscillatory movements of regular frequency in one or more parts of the body. It is one of the chief features of MS, as part of Charcot’s triad of diagnostic symptoms, along with nystagmus and scanning speech. In MS, tremor affects the upper limbs, and this can impair the quality of life by hindering coordinated or fine motor movements. 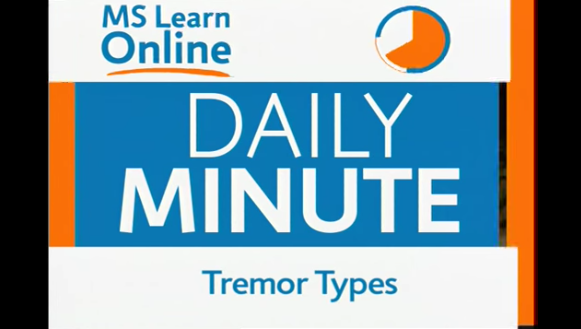 Thus the presence of tremor is associated with a higher risk of disability or dependent living in patients with MS. Other sites of tremor in MS include the head and neck, the vocal cords, the trunk and limbs. Patients with MS show either a postural tremor or an intention tremor, both of which are large in amplitude. While the first occurs in a body part which is being maintained against gravity, the latter occurs during a movement which is directed towards a target. In this case the amplitude of the tremor increases as the part is moved towards the target with the eyes open. Cerebellar pathology underlies the tremor in MS, often in a multifocal manner. Cooling the affected arms leads to a dramatic reduction in the intensity of intention tremor. Cooling may lead to reduced muscle spindle function, as the nerve conduction velocity is lowered. As a result, less data enters the cerebellar neuronal loops which produce tremor, relieving the symptoms. The intention tremor of MS is probably due to altered muscle contractions in response to sensory proprioceptive information from the muscle spindles, tendons, and receptors in the joints and the skin. Proprioception refers to data regarding the velocity and amplitude of a muscular movement which is transmitted via the spinocerebellar pathway. There are several methods in use to evaluate the severity of tremor and its impact on the quality of life of the patient. For example, Bain et al developed a 10-point severity-of-tremor scale, while accelerometry and polarized light goniometry are other neurophysiologic tests. Many of these are not designed to measure the ataxia that is associated with tremor in MS, however. This refers to selective destruction of a small area of the thalamus, most commonly the nucleus ventralis intermedius (VIM), to inhibit tremor production. Most patients show dramatic improvement immediately after the surgical procedure, which is maintained for more than a year afterwards. Gamma-knife thalamotomy has been introduced as an alternative to surgical destruction. Unilateral thalamotomy is carried out to prevent an unduly high incidence of side effects. This refers to the placement of an electrode into the brain to suppress tremor production. It produces approximately as good results with respect to tremor reduction as thalamotomy, but the adverse effects appear to be lower in frequency.